For thirty years, Professor Eric Foner has been teaching his popular Civil War and Reconstruction history class to undergraduates at Columbia University. Foner has written seminal books in the field, including Free Soil, Free Labor, Free Men, on the ideology of the Republican Party before the war, Reconstruction: America’s Unfinished Revolution, the definitive study of that time period, and The Fiery Trial, about President Lincoln and slavery. The themes running through his work—race in America, the influence of radicals on history, and economic oppression as a force of white supremacy—have never felt more relevant. He is also an amazing lecturer. I know this because I’ve been following the class via a massive open online course (MOOC). 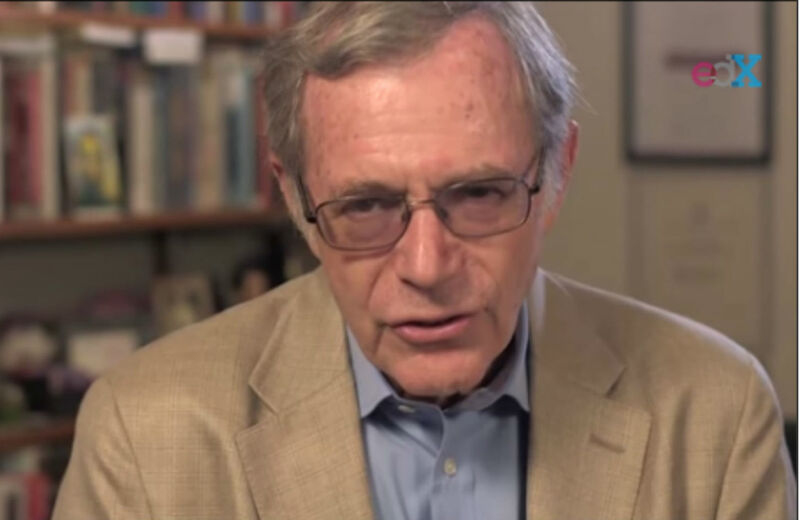 Foner wanted to document his last time teaching the course, and he’s teamed with edX to present it as three online classes. The first, The Coming of the Civil War, is over and available on Youtube. The second, on the Civil War, recently concluded, and the third, on Reconstruction, starts at the end of February. All three will be available on iTunes afterward for posterity. Mike Konczal: What are some of the challenges in translating your course to an online audience? Eric Foner: I’m a pretty low-tech kind of person. I don’t exist on social media. I’m not on Facebook or Twitter. That’s how I actually get work done, ya know? I don’t worry about it. One of the challenging things according to the people involved is that people’s attention spans online are shorter. My lectures are an hour and fifteen minutes, but here they have to be broken up into ten-minute segments. But I wasn’t lecturing with a clock, timing the transitions. So I had to go back over all the lectures and find a place to have a break. And then you add in quizzes and primary sources in-between those segments. So what I see as a seamless lecture gets broken up into segments. Fundamentally, this is my course, just with a lot of bells and whistles. It differs from most of these MOOCs, which are produced in a studio. That’s not what I’m doing; I’m showing what a class at Columbia is. The classroom setting works well in the video. There’s a lot of little moments of you reacting to the audience that comes through. It would have been easier to do it in a studio. Setting it up in a classroom there’s all kinds of intangible things that you can’t predict. I said, “No, forget that.” They even said that they’d get students to volunteer and sit there. Nobody is going to volunteer for a whole semester to do that! But the most important thing is the energy. A lecture is a performance, and you feed off the audience, and if they respond, you respond. It had a much lower dropout rate than most of these MOOCs. It started off with about 7,000 people and maybe five or six thousand finished the course. A lot of these things have large dropout rates. But the people who took this seem to be committed. Quite a few participated in the online forums. But this is not the future of education. At least I hope not. But it is a tremendous adjunct to education. What appealed to me about this is that the students are all over the world, all of different ages, many retirees, students, teachers. So I’m using this to reach people I’d never encounter in my classroom. And that’s our job, to spread knowledge. An early lecture described at length how historians argue and think about the Civil War over time. Why is that important for the class? This is what we call historiography. The word itself is an invitation to fall asleep, right? But it’s critical to any history course, getting students and viewers to understand that history is not just a body of facts. It is not just a fixed set of information that people have to memorize. It is always changing and being debated. Revising history is the name of the game. That’s how our knowledge increases, with new perspectives and new questions. This era has been written about for well over a century. Looking at how historical interpretation has changed over time is essential to thinking about this period. In the first MOOC, I talk about the coming of the Civil War and how many different scholars have described that. Reconstruction is maybe the most striking example of how historical interpretation has radically changed over the past thirty or forty years, compared to the accepted interpretation that dominated for the first half or more of the twentieth century. What are the consequences of that? Historical interpretation has real world impact. They’re not just ivory tower questions. Later on in the second MOOC I’ll talk about how historians have interpreted why the Confederacy lost. There are internal and external explanations, military, political and social explanations. How historians have tried to balance all that is another example. It’s hard for people not versed in history to get the point on why historical interpretation changes. In the general culture “revisionist historian” is a term of abuse. But that is what we do. Revising history is our job. So every historian is a revisionist historian in some sense. How hard is it to communicate to the students that a bad history of Reconstruction really harmed the country for a long time? I make a big point of it in my third course. The traditional or Dunning School of Reconstruction was not just an interpretation of history. It was part of the edifice of the Jim Crow System. It was an explanation for and justification of taking the right to vote away from black people on the grounds that they completely abused it during Reconstruction. It was a justification for the white South resisting outside efforts in changing race relation because of the worry of having another Reconstruction. All of the alleged horrors of Reconstruction helped to freeze the minds of the white South in resistance to any change whatsoever. And it was only after the Civil Rights revolution swept away the racist underpinnings of that old view—i.e., that black people are incapable of taking part in American democracy—that you could get a new view of Reconstruction widely accepted. For a long time it was an intellectual straitjacket for much of the white South, and historians have a lot to answer for in helping to propagate a racist system in this country. What do you want the students to take away from the story of Reconstruction instead? I wrote my book on Reconstruction twenty-five years ago, and though it’s been successful, I’m not crazy enough to believe it’s changed everybody’s mind or attitudes about the period. I want people to understand that Reconstruction was a pivotal moment in the history of American democracy. It was not just about the South, or not just about black people. It was, as W.E.B. Du Bois said in Black Reconstruction long ago, a moment in the history of democracy. Would the United States in the aftermath of slavery be a democratic country or not? It was an amazing attempt, an inspiring attempt, to create an interracial democracy from the ashes of slavery. It had great successes and some failures. Eventually it was overthrown by violence and terrorism. And the consequences of the failures of Reconstruction were disastrous for black Americans and really warped the whole history of the United States since then. The elimination of a large part of the American working class—that’s what black people were at that point—shifted the entire framework of American politics to the right for generations to come. You read Ira Katznelson’s book Fear Itself, about the New Deal, and how the racist Southern members of Congress helped to shape and warp the New Deal. Well, that’s the failure of Reconstruction playing out fifty years later. The reasons for that is blacks can’t vote! The overthrow of Reconstruction is a tragedy that really had long-term consequences that we are still grappling with today. The section of the class covering the coming of the Civil War identifies slavery as the fundamental cause. Do you find that’s easy to convince students of, or do they come in with strong assumptions there were other, more important, causes? To say slavery was the fundamental cause of the Civil War is not to say that there were not other causes. But it is to direct attention to the basic division in the country that lead to conflict—a society based on slave labor and a society based on free labor and their differing visions of the American future. Yes, there is deep resistance to that idea. When I lecture around about this, many people say it’s about states’ rights, or even the tariff. To some extent, I think this is because people are cynical nowadays about politicians, for reasons we all know. And the idea that politicians might be motivated by something is that is grander than pure naked self-interest is hard for some people to accept. Now when I say slavery is the fundamental cause of the Civil War, I’m not saying that all Northerns were abolitionists, or that all Southerners soldiers were fighting for slavery. Obviously, that wasn’t the case. The cause of a war is not the same question as why people fight in a war. Your book on Abraham Lincoln, The Fiery Trial, is covered in the class. What’s it like to lecture to students on Lincoln? There’s a million Lincolns out there, and every Lincoln you want can be found. Racist, emancipator, politician, radical, conservative. With Lincoln at least you have a head start. Every student has heard of Lincoln, no matter how much history they’ve studied. You can use that to build on and challenge it. What new trends in recent Civil War scholarship do you find exciting? Some of the most exciting work is on slavery and its relationship to capitalism. Edward Baptist’s book, The Half Has Never Been Told, as well as Sven Beckert book, Empire of Cotton. In a recent Nation piece, Tim Shenk, who is also the MOOC course TA, noted how the slavery scholarship has moved from Virginia to the Deep South, reflecting this interest in the relationship between capitalism and slavery. Right, because the Deep South is the dynamic part of the South. It’s the Cotton Kingdom. A lot of this new literature ignores the upper South, which is much more decrepit economically. Virginia was surviving on selling slaves to the Deep South. That’s not a viable economic structure, ultimately. The Deep South is a driving force in the expansion of American capitalism at the time. New historians have shown this very effectively, and I think this is important work. There’s also a lot of important work done in the past ten years on gender and the Civil War and Reconstruction. Stephanie McCurry’s Confederate Reckoning, on poor Southern women and their responses to the Confederacy, for instance. The greater introduction of gender into discussions of the period is a great move forward, because it deepens, broadens and complicates our view of that era. Your first book was about the ideology of the Republican Party before the Civil War. In the aftermath of the recent election, a lot of people are arguing that the Democrats don’t have a vision or are out of ideas. I wonder how you see them as someone who has thought a lot about ideology and parties. I’m sympathetic to the idea that the Democratic Party, whatever that is, lacks a vision or an ideology. But many people have said this. Why? That is because it is a conglomeration of mutually exclusive parts. It contains a large part of the American working class, which has suffered greatly since the Great Recession began. But it also contains a lot of Wall Street people and well-to-do people, and new technologists. What policies is going to unite these people? It’s hard to find a unifying theme among them, other than they don’t want the Republicans in power. Now, that often gets you fairly far, but it doesn’t allow you to govern very effectively. Your work has a lot of relevance for people writing on the left these days. Ta-Nehisi Coates had an online book club for Reconstruction, and your work clearly influenced his recent blockbuster essay, “The Case for Reparations.” Chris Hayes wrote in The Nation about combating global warming as a new abolitionist cause, citing your work. What kind of relevance for our current political situation do you see your work on this era having? Relevance is a two-edged sword for the historian. We want it, but we don’t want too much of it. There’s always a danger of tying yourself to the moment in a way that will make your book irrelevant pretty quickly. If I had written a book that was tied to the Iraq War, it would go out of relevance faster. So the relevance is a step up from the specific issues of the moment. The relevance is to race in America, which is not going away. Those books will still be relevant as long as race is a problem in our society. I’m retiring in another year from teaching, and this has lead me to think about my own career and what my own writing is about. And what interests me fundamentally in all my writing is how change occurs. Who is responsible, where are the cutting edges, what are the obstacles. The Lincoln book is how emancipation happens and the consequences of it, and the intersections between a pretty enlightened leader and social movements. It doesn’t happen because a guy signed something with a pen. There’s a whole world of anti-slavery movements out there, and the slaves themselves taking actions. It’s this combination of a forward-thinking leader and social movements who can bring about radical change. Reconstruction is another example. And if there’s a lesson there, it’s that, as they used to say, the price of liberty is eternal vigilance. Rights can be won, and rights can be taken away. Achievements are always vulnerable. Reconstruction is both an inspiring and tragic story at the same time. And that might be why people don’t understand it very well. It doesn’t have a happy ending.